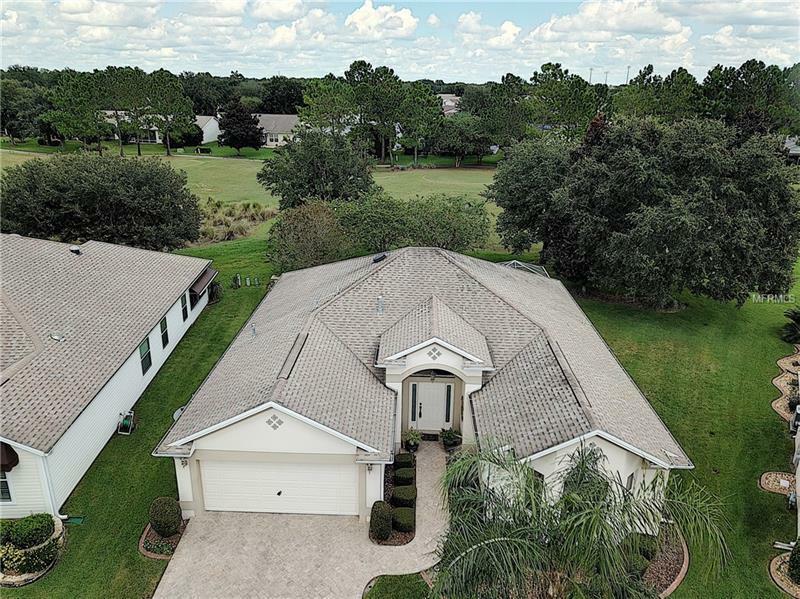 This SPECTACULAR GOLF FRONT LANTANA will catch your attention at first glance â PAVER DRIVE Mature Landscaping w/Custom Curbingâ¦and youâll feel right at home the moment you enter. The Spacious Kitchen has TILED COUNTERS SS Appl. (New D/W and Stove) Custom Backsplash PULL-OUT Shelves + a Lg Breakfast Bar. The Kitchen is open to the Breakfast area and Living & dining rooms all with Staggered Tiled floors â very nice! The inside laundry with NEW W/D has extra cabinets plus a cozy space perfect for a Private officeâdesk included! The Lg. N. FACING Screened Lanai opens to a Birdcage and there is ROOM for A POOL on this Lg. Pie-shaped homesite! The Golf Cart Trail is on the opposite side of the golf course so you can fully enjoy the peaceful setting overlooking the #4 Tee of Churchill Downs â truly a PEACEFUL SETTING! The Master Suite has a Large WIC Dual Sinks w/TILED Counters Sit-down Vanity & Tiled Shower. Both Guest BRs have closets and the Guest Bath has a Tub/Shower combo. This lovely home has a CENTRAL VACUUM SYSTEM NATURAL GAS VAULTED KNOCKDOWN CEILINGS ATTIC STAIRS/STORAGE + extra Cabinets & the EXTERIOR was REPAINTED approx. 4 yrs ago. Located in the desirably Village of BELVEDERE you are close to 6 pools major shopping Rec. Ctrs & lots of golf courses!! TURNKEY Package may be negotiated separately. To view 3-D and Video tours click the "tour" buttons above the main photo. Tax line reflects property taxes only. CDD line reflects bond maint. & fire. Bond Bal: $6926.49.